Lace mats have become more and more popular with cake decorators but they are a unitasker. Most of us might use them a few times a year to make edible lace, but that’s it. Kevin from Bake boss made a great video showing how to use them to create decorative patterned jaconde sponge layers. The recipe is what most people use for a piped or combed patterned jaconde sponge. Check out his original video here. Or look up the Bake Boss YouTube channel and search for their ” baking in a lace mat” video. This cake is a combination of a few different ideas and recipes I have collected together from a few different sources. The decorated sponge outside is made by spreading jaconde sponge mixture onto a silicone lace mat. 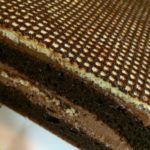 The inside of the cake is made with a dark chocolate roulade sponge recipe from Kara’s couture cakes check out her incredible blog here. Decorative part – enough for two mats. Mix with a fork until lump free. Do not incorporate air, butter needs to be warm or you’ll incorporate air. Swap cocoa with cornflour and add gel colours if you want some variation other than brown. Place 2 silicone lace mats on a baking sheet, spray lightly with oil, scrape the jaconde mix into the pattern and remove any excess with a bench scraper or angled palette knife. Place the trays in the fridge to firm up the mixture. Alternatively, you could pipe the pattern onto the smooth side of the mat. Whisk the butter and yolks into the almond meal. Beat the egg whites with the salt, slowly add the sugar and whip until soft peaks form. Carefully fold some of the meringue mix into the butter mix, continue adding until a roughly equal amount of meringue has been added to the butter mix, then fold the butter mix into the remaining meringue mixture. Sift the flours in on top and very gently fold in until there are no more streaks of flour. Divide the mixture into two equal parts and spread very thinly and evenly over the chilled lace mats, run your finger around the edge of the mats to allow some room for spreading and to help prevent the sponge mix running off the edge. Bake in a 150C oven for 5-7 minutes, or just until set. Avoid overbaking, this is a very thin sponge, it quickly goes from being a flexible thin sponge sheet to a very brittle crunchy biscuit. Once set, cover with a sheet of nonstick baking paper, turn upside down to cool on the baking paper with the silicone still attached, this helps to seal in the moisture. Cool for 5 minutes before gently peeling off the silicone lace mat backing. 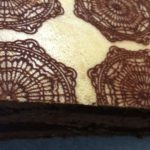 Black Cocoa Roulade – original recipe from Kara’s Couture cakes. Make two or three cocoa roulade sheets depending on how many layers you want the cake to have, two works nicely. 70g (2.5oz) dark, dutch process cocoa powder. (The Cadbury Bournville cocoa is not quite right but still works). Make a meringue with the egg whites and sugar- whip egg whites, slowly add sugar a few spoonfuls at a time and beat until it is all dissolved. In a separate bowl beat the egg yolks briefly then pour onto the meringue. Fold through until just, combined quickly sift the cocoa onto the meringue mix and quickly fold through until combined. Combine water and gelatin in a microwave safe mug let sit for 10 minutes then heat for a 30 seconds stirring every 15 seconds, continue to heat and stir in 10 second intervals until all of the gelatine is melted. Allow the mixture to cool, but not set, it can’t be hot when it is added to the cream. Whip the cream to soft peaks, pour the gelatine and vanilla in a steady stream while beating at a medium speed, then sift in the cocoa, icing sugar and salt. Mix until the cocoa and sugar are combined, taste and add more sugar or cocoa to suit your taste. whip until firmer peaks can be formed from the cream. Store in a covered bowl the fridge until ready to use. Add juice, sugar, gelatine, and cherries to a saucepan. Heat just enough to melt the sugar and gelatine. Once melted, blend everything together with a stick blender. Pour into one or two baking trays lined with clingfilm, then place in the fridge to set. For a more fancy finish, set in two trays and turn them out onto the cake while assembling it. I’m too impatient for this so often just scrape it out of the tray and spread it on in a messy jelly layer. 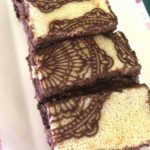 Assemble by starting with one layer of decorated sponge, spread it thinly with the cream, lay on the first cocoa roulade, then add a thicker layer of cream, lay on the jelly layer, then roulade, cream, and printed sponge, vary the layers to suit. Chill the assembled cake in the fridge for a few hours, or freeze for an hour prior to trimming off the outside edge for neatness and then cutting into generous rectangular slices to serve. Mix with a fork until lump free. Do not incorporate air, butter needs to be warm or you'll incorporate air. Swap cocoa with cornflour and add gel colours if you want some variation other than brown. Place 2 silicone lace mats on a baking sheet, spray lightly with oil, scrape the jaconde mix into the pattern and remove any excess with a bench scraper or angled palette knife. Place the trays in the fridge to firm up the mixture. Alternatively, you could pipe the pattern onto the smooth side of the mat. Allow the mixture to cool, but not set, it can't be hot when it is added to the cream. I'm too impatient for this so often just scrape it out of the tray and spread it on in a messy jelly layer. Assemble by starting with one layer of decorated sponge, spread it thinly with the cream, lay on the first cocoa roulade, then add a thicker layer of cream, lay on the jelly layer, then roulade, cream, and printed sponge, vary the layers to suit. Chill the assembled cake in the fridge for a few hours, or freeze for an hour prior to trimming off the outside edge for neatness and then cutting into generous rectangular slices to serve. Lace mats have become more and more popular with cake decorators but they are a unitasker. Most of us might use them a few times a year to make edible lace, but that's it. Kevin from Bake boss made a great video showing how to use them to create decorative patterned jaconde sponge layers. The recipe what most people use for a piped or combed patterned jaconde sponge. Check out his original video here. Or look up the Bake Boss YouTube channel and search for their " baking in a lace mat" video. blog2The decorated sponge outside is made by spreading jaconde sponge mixture onto a silicone lace mat. The inside of the cake is made with a dark chocolate roulade sponge recipe from Kara's couture cakes check out her incredible blog here. Decorative part - enough for two mats. Lace mat spongeMix with a fork until lump free. Do not incorporate air, butter needs to be warm or you'll incorporate air. Swap cocoa with cornflour and add gel colours if you want some variation other than brown. Divide the mixture into two equal parts and spread very thinly and evenly over the chilled lace mats, run your finger around the edge of the mats to allow some room for spreading and to prevent the sponge mix running off the edge. Bake in a 150C oven for 5-7 minutes, or just until set. Avoid overbaking, this is a very thin sponge, it quickly goes from being a flexible thin sponge sheet to a very brittle crunchy biscuit. Once set, cover with a sheet of nonstick baking paper, turn upside down to cool on the baking paper with the silicone still attached, this helps to seal in the moisture. Cool for 5 minutes before gently peeling off the silicone backing. Black Cocoa Roulade - original recipe from Kara's Couture cakes. Combine water and gelatin in a microwave safe mug, heat for a minute stirring every 15 seconds, continue to heat and stir in 10 second intervals until all of the gelatine is melted. Enough gelatine to set 600 ml of liquid just under 3 teaspoons. Add juice, sugar, gelatine, and cherries to a saucepan. Heat just enough to melt the sugar and gelatine. Once melted, blend everything together with a stick blender. Pour into one or two baking trays lined with clingfilm, then place in the fridge to set. For a nicer finish, set in the two trays and turn them out onto the cake while assembling it.